ATTENTION: WE ARE CURRENTLY EXPERIENCING A LACK OF FUNCTIONALITY WITH OUR PAYPAL BUTTONS AND ARE WORKING TO UPDATE THEM. IN THE MEANTIME, IF YOU EXPERIENCE PROBLEMS ORDERING, PLEASE EMAIL US AT SALES@GOKARTGALAXY.COM AND GIVE US YOUR PARTS LIST AND SHIPPING ADDRESS. WE WILL THEN SEND YOU AN ITEMIZED INVOICE THROUGH PAYPAL. associated or affiliated with Azusa Engineering, Inc. Questions? Email sales@gokartgalaxy.com 7 days a week. We accept your credit card payments through PayPal. You don't even need a Paypal account. Go Kart Galaxy has the go kart parts and minibike parts you need for your school projects. As a school/college, you qualify for the UPS Business rate for all orders shipped to you. Contact us about your order and we'll work with you to get you the parts you need for your project! Your purchase order is accepted. If you need an axle for your go kart, look no further. We've got many different lengths and several different diameters available. We also have axle bearing kits so that you can mount your axle to your go kart. If you need wheel bearings for your go kart or minibike, look no further. We've got many different varieties to fit your application. We've also got plenty of tie rod end bearings to choose from. Go Kart Galaxy has a wide variety of brakes available for your go kart or minibike. You can choose from three sizes of drum brakes, two sizes of band brakes, as well as one size of mechanical disc brakes. We've got plenty of bushings and spacers to choose from for your go kart or minibike. From steel, to aluminum, to nylon, we've got what you need. If you're after a steel bushing but don't see the exact length you need, you can simply get the 5" spacer and cut what you need out of it. Browse through 50 pages of Azusa go kart parts and minibike parts at your leisure. Azusa Engineering's product catalog includes pictures and descriptions of its full product line of go kart parts and minibike parts. This catalog does not include Go Kart Galaxy's current prices of these products. We've got chain for your go kart or minibike, as well as for pocket bikes. We've got sizes ranging from #25 all the way up to #530 chain. If you need a chain guard, we've got a universal guard, as well as a guard made to fit most Briggs and Tecumseh engines. And of course, without a chain breaker you're up a creek. We've got two to choose from that are easy to use and make outfitting your go kart or minibike a breeze. If you need a clutch for your go kart or minibike, we've got what you need. We have clutches for #35 and #40/41 chain drives. Bores available are 5/8", 3/4", and 1". If you're wanting to start a go kart or minibike build, we've got a go kart frame and a minibike frame you can use. Engine plates, fenders, foot pegs, a kickstand, and other weldements are also available. And of course, we've got all the other go kart parts and minibike parts so you can complete your build! If you need fuel line or fuel fittings for your go kart or minibike, we've got what you need. We sell fuel line by the foot at a great price. If you want to build a go kart or minibike from the ground up but can't fabricate a frame yourself, you should try our go kart kits and minibike kits. They include all the go kart parts and minibike parts you need to complete the build, except for the engine, clutch, paint, and tools. Detailed step by step instructions included. We've got brake and throttle pedals, brake and throttle control rods, and all the associated hardware so that you can outfit your go kart or replace your worn out components. Go Kart Galaxy has go kart and minibike seats, covers, and complete seat kits available. We have two sizes of minibike seats to choose from, as well as one size of go kart seat. We've got mechanical, hydraulic, and heavy duty hydraulic shock absorbers for your go kart or minibike. Compression ranges from 450 lbs. to 730 lbs. With two diameters and three different axle lengths to choose from, Go Kart Galaxy has the spindle sets and components you need for your go kart or other small vehicle application. Go Kart Galaxy has a wide selection of sprockets and sprocket hubs for your go kart or minibike. Finished and blank sprockets range from #35 all the way up to #530 pitch. We have sprocket hubs for 1" and 1 1/4" live axles. If you don't see your sprocket pattern listed, contact us and we'll see if we can help. We have both 10" and 12" diameter steering wheels available, as well as a polished aluminum butterfly steering wheel and a black butterfly steering wheel. We also have steering shafts ranging from six inches to 34 inches long, as well as all the necessary hardware. Go Kart Galaxy has plenty of minibike brake and throttle control components to choose from. You can choose from poly lined or unlined conduit, or you can even buy a minibike throttle assembly without the precut cable and conduit, and just get one long enough to fit your needs. There are three precut lengths of brake cable and conduit to choose from as well. With four diameters of conduit and cable, multiple precut lengths of each, and a variety of fittings, this is your one stop shop for your cable and conduit needs for your go kart or minibike. If you have a need for a large quantity of cable and conduit, 50 and 100 foot rolls are available. Go Kart Galaxy has tie rods in two diameters and multiple lengths, so chances are you'll find what you need for your go kart. If you're on a budget, you might consider using our economy tie rod kits. If nothing but the best will do, get the deluxe aircraft quality tie rod kits. If you need tires and inner tubes for your go kart or minibike, this is the place for you. We've got go kart tires, minibike tires, and pocket bike/scooter tires, as well as all the inner tubes you need. Go Kart Galaxy has five different diameters and six different styles of wheels available for your go kart or minibike. We've also got three different materials available: aluminum, steel, and nylon. At the bottom of each wheel product page is a tire fitment chart you can use to pick out the right tire to fit on the go kart or minibike wheel you want. Are you buying your go kart parts or minibike parts on a tight budget? Sometimes we receive go kart and minibike parts that just aren't saleable as new. Whether it's spindles with a bit of rust on them or fenders with some scratches or blemishes, you can take advantage of clearance prices on these fully functional parts. Please read the information on this page. It contains information such how the ordering and shipping process works, lead time to ship orders, and returning merchandise. If you are ordering go kart parts or minibike parts and are from another country, it is imperative that you follow the instructions on this page. No matter who you are, many of the questions you may have about the ordering process both before and after it occurs are answered on this page. You can save yourself and us alot of time simply by reading what is on this page. If you have questions that are not answered on this website, feel free to contact us. We'll do our best to answer your questions. If we don't know the answer, we'll say so. The last thing we want to do is GUESS and lead you astray with an incorrect answer. We'll also try our best to refer you to someone who might be able to answer your questions if we cannot do so. Be sure to visit this page as well as the ORDERING & LEGAL INFO before contacting us with a question. You could be saving your time and our time by doing so. 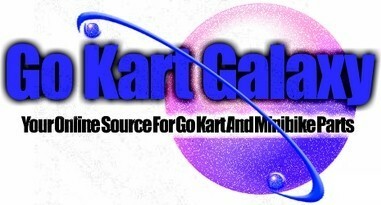 From time to time, manufacturers or suppliers either raise prices or upgrade their products, and these changes may not be shown on the Go Kart Galaxy website as soon as this occurs. This is why the products may differ slightly from what is shown. However, all changes are usually to improve or update the product, and does not lower the quality of the merchandise. Parts ordered from Go Kart Galaxy should be installed and used by persons who are familiar with mechanical parts and their proper use and installation. The customer assumes responsibility for maintaining products and/or equipment in safe operating condition. Copyright 2004 by Go Kart Galaxy.